GitHub - Raptor-Fics-Interface/Raptor: Raptor is a multiplatform chess interface for freechess.org (aka FICS). Want to be notified of new releases in Raptor-Fics-Interface/Raptor? 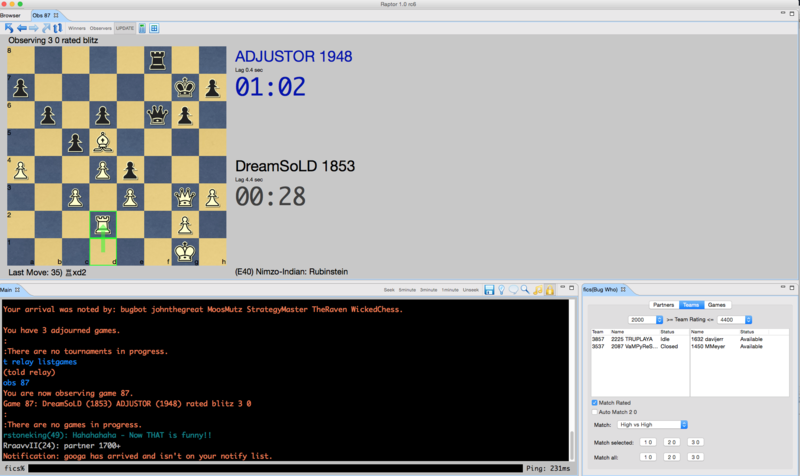 Raptor is a multiplatform chess interface for freechess.org (aka FICS). Makeover of Chess Analysis tab. Now shows best 5 moves. Makeover of the Bughouse tabs. Lots of bug fixes. (including the elusive timeseal bug). Removal of features that nobody ever used. Tweaks that I have been meaning to do for the last few years. Inclusion of all chess sets in the expansion pack. Added more chess square backgrounds. Raptor has recently moved from google code to github. If you are a former contributor please let cday know your github user id on fics and I will gladly add you to the project.